Alopecia encompasses a broad range of hair loss disorders, generally categorized into scarring and non-scarring forms. Depending on the specific pathogenesis of hair loss and geographic location, a number of psychiatric and medical comorbidities, including but not limited to thyroid disease, lupus erythematosus, diabetes mellitus, atopic dermatitis, sinusitis, coronary artery disease, anxiety, depression, and suicidality, have been identified in association with alopecia. In addition to the numerous associated comorbid conditions, patients with alopecia report decreased quality-of-life measures across symptomatic, functional, and global domains. While alopecia can affect patients of all ages, genders, and ethnicities, hair loss may more significantly impact women as hair represents an essential element of femininity, fertility, and female attractiveness in society. Individuals of lower socioeconomic status may also face health disparities in the context of alopecia as a majority of hair loss treatments are considered cosmetic in nature and accordingly are not covered by third-party insurance providers. Although traditionally thought of as a merely aesthetic concern, alopecia encompasses a significant burden of disease with well-defined comorbid associations and genuine psychosocial implications, and thus should be assessed and managed within a proper medical paradigm. No funding was received for the preparation of this article. Mr. Dustin Marks, Dr. Lauren Penzi, Dr. Erin Ibler, Ms. Athena Manatis-Lornell, Ms. Dina Hagigeorges, Dr. Mariko Yasuda, Dr. Lynn Drake, and Dr. Maryanne Senna have no conflicts of interest to report. Otberg N, Shapiro J. Chapter 88: hair growth disorders. Fitzpatrick’s Dermatology in General Medicine, 8th ed. AccessMedicine, McGraw-Hill Medical. New York: The McGraw-Hill Companies; 2012. Available at: https://accessmedicine-mhmedical-com.ezp-prod1.hul.harvard.edu/Content.aspx?bookId=392&sectionId=41138795. Accessed 6 Sept 2018. Singam V, Patel KR, Lee HH, Rastogi S, Silverberg JI. Association of alopecia areata with hospitalization for mental health disorders in US adults. J Am Acad Dermatol. 2018. https://doi.org/10.1016/j.jaad.2018.07.044 (epub 6 August 2018). Alopecia Market Analysis By Treatment (Oral, Topical, Injectable), By Gender (Men, Women) And Segment Forecasts To 2024. PR Newswire. 2016. Available at: https://www.prnewswire.com/news-releases/alopecia-market-analysis-by-treatment-oral-topical-injectable-by-gender-men-women-and-segment-forecasts-to-2024-300341049.html. Accessed 5 Sep 2018. Chen JX, Justicz N, Lee LN. 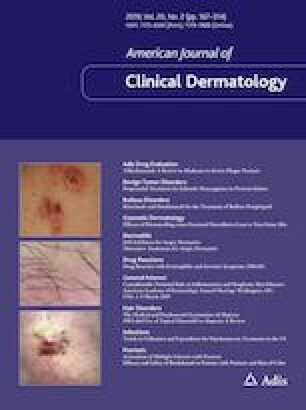 Platelet-rich plasma for the treatment of androgenic alopecia: a systematic review. Facial Plast Surg. 2018. https://doi.org/10.1055/s-0038-1660845 (epub 28 Jun 2018).